When you think of bridges you don’t usually think of biotechnology or gardening. But that is exactly what the Khasis traditionally did. 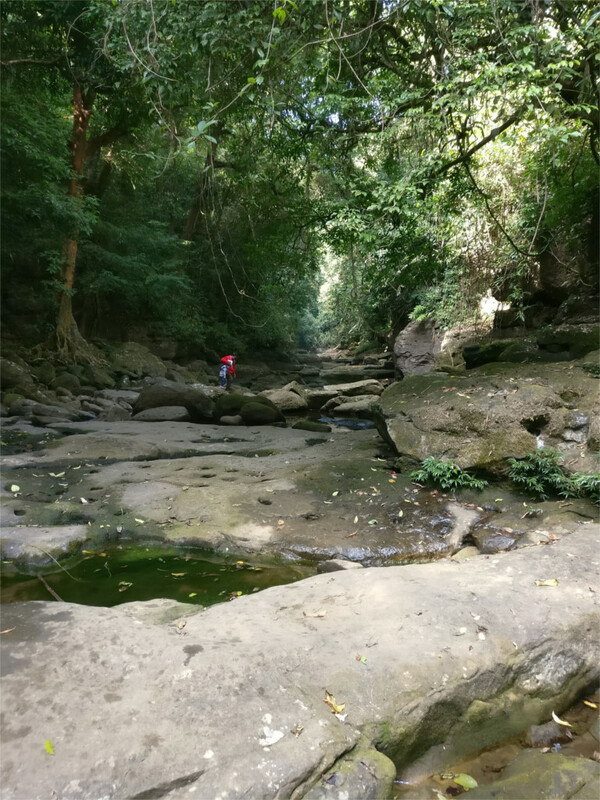 First you have a gorge to be bridged, then you find two rubber trees facing each other across the gorge. Next you coax the roots towards each other, perhaps along poles or planks. Then, when the roots meet each other, you begin pleating them together and, by a process called pleaching, encourage them to fuse. That’s how the bridge that you see in the featured photo was built. Once the platform is ready, layers of mud are laid down over it to make a easily traversed road. I suppose the weight that the roots can carry is a concern. On the day that we were there a couple of people were standing at each end of the bridge to do some traffic control, mainly to make sure that the platform was not overloaded. down to stay the platform. As an engineering design, Mumbai’s sea link is no different from this. Interestingly, it seems that the whole community which uses the bridge is trained to carry out repairs on it, so that a villager passing by can braid the roots a little and put up a truss to guide a branch. 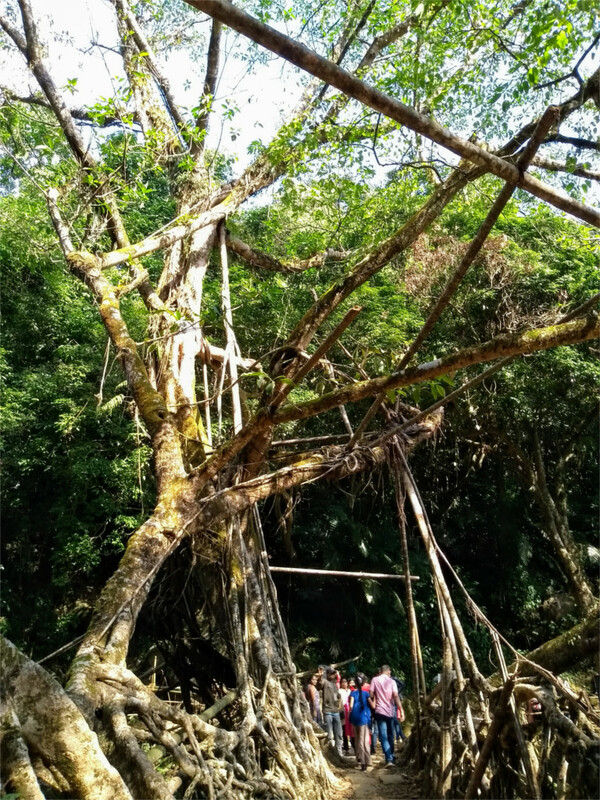 This particular living root bridge was close to Mawlynnong village. There are many of these bridges scattered across the Khasi and Jaintia hills. I guess it takes time for the tree to grow, but it can’t be many years. I’ve seen other Ficus trees grows roots which touch ground within months. So I guess it might take no more than a decade to make a bridge. Ficus elastica, the rubber plant, is said to live for about 200 years in the wild. So, during its lifetime the bridge would get stronger. If the community plans well, then they can even begin to replace an old tree before it dies. 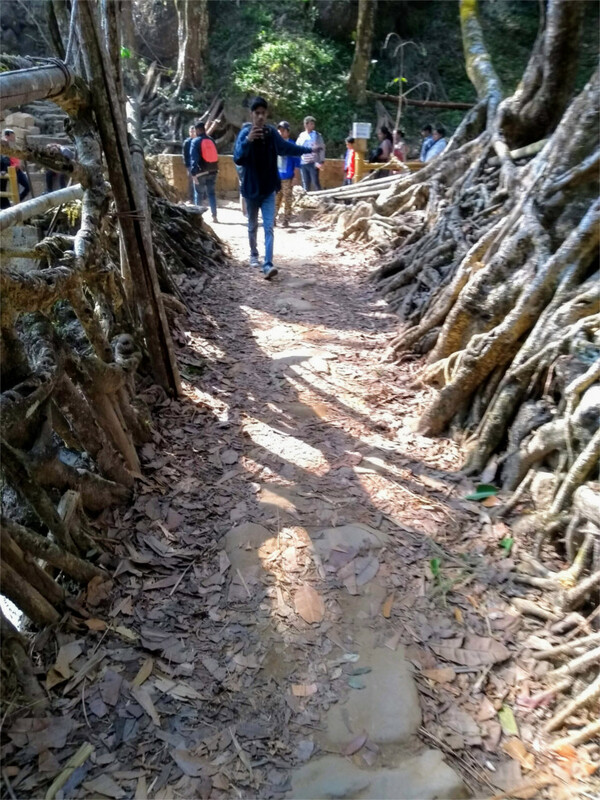 It is said that one of the root bridges near Sohra (Cherrapunji) has lasted 500 years. This could be hearsay, since the earliest documentation of these structures was published in 1844 in the Journal of the Asiatic Society of Bengal. However, it is not unthinkable that this could happen, given that the technology is widely shared between tribes. The banks of the river here were not very high. In winter the water reduces to a trickle. 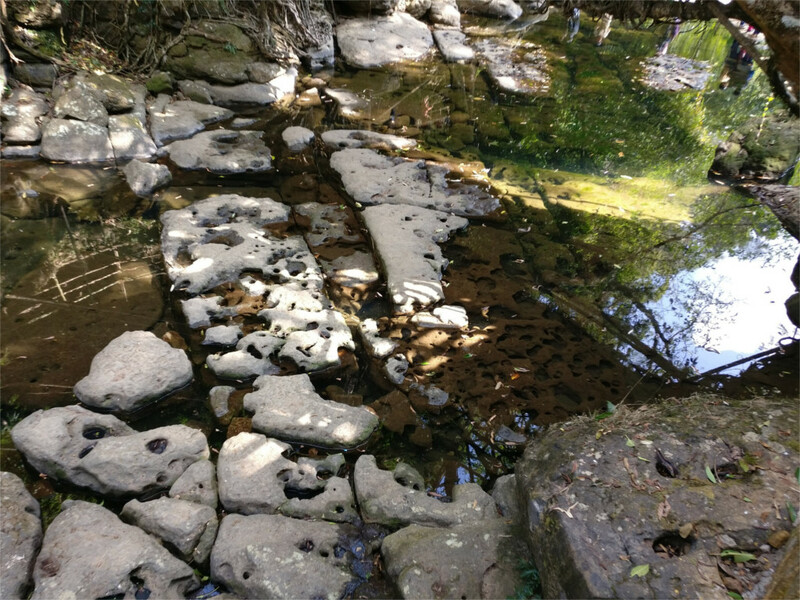 So I climbed down to the river bed to take a look at the interesting flat stones along the bed. Much of the clan had already gathered here. The pools and stones were nice and cool after the climb down to the river from the road. I was impatient to get back up. People were selling cut pineapples dipped in red chili powder on the track, and I needed some of that.